In general, submissions are accepted during the month of March, the judging is completed and winners are notified in April, and the public awards ceremony is in May of each year. Specific dates are posted as soon as they are available (see the 2019 Contest page). The submission dates are inflexible and poems received before or after the deadline will not be considered in the judging. Who can submit a poem to the contest? The contest is open only to residents of Whatcom County, Washington. Poets may be any age and have any level of writing experience. Is there a fee to enter the contest? No! There is no charge to enter the contest or to attend the awards ceremony. Why don’t you have age or experience categories for poets? Poetry reflects personal experience. A child’s experience is just as acute, complex, and rich as an adult’s. We leave it to the judges to decide which poems seem to express experience, observations, and feelings most effectively. The contest honors the vision and creativity of all writers. Each year, the contest committee invites two respected, published Northwest poets to judge the contest. A list of judges can be found on the About page and many are included in the “Boynton poems and poets” links, at right. How is the judging done? The contest uses “blind” judging. We ask each poet to submit two copies of his or her poem — one with the poet’s name and contact information, the other with no personal identifying information. Each poem is given a code number. The judges see only the numbered poems and have no way of knowing the poet’s identity. The judges read every single poem (often multiple times), share their thoughts with each other and eventually narrow the field to 25: ten Walk Awards and 15 Merit Awards. This is extremely challenging; the judges tell us that many of the non-winning poems are outstanding and publishable. Once the judges have made their selection, the winning poems are returned to the committee, the numbered poems are matched with their poets and the winning poets are notified by phone or email by a date that is specified in the Guidelines. Note: we recognize that poets want to know whether or not they have won; while we cannot contact each poet individually by phone, if poets provide us with a valid e-mail address, we will notify them when the judging is complete and the winners have been notified. ALL poets are invited to attend the awards ceremony; only winning poets are invited to read their poems at the ceremony. Note 2: our judges are unable to offer comments or critiques on poems submitted to the contest. Some of the committee members are winning poets. Is that fair? Members of the Sue Boynton Poetry Contest committee are not allowed to submit poems to the contest. However, a number of our committee members are past winners and were recruited for their interest in community poetry — and their willingness to work hard on its behalf! Why are you so particular about number of lines and characters? How do you count lines and characters? If your poem has too many lines or too many characters on any line, it will be disqualified. Please take the time to make your corrections before submitting your poem! Click for a printable (.pdf) sample submission form. You may also view a blog post on counting characters here. Can I include artwork or print my poem in a special font? We ask poets to please let their words stand on their own merit — no artwork (including clip art), no special fonts, no unusual paper or colors and no radical line configurations that push the poem beyond the line and character count. Is there a theme for the contest? No. In the contest’s first two years, poets were asked to address a specific theme (community, diversity), but now they can write on any subject. Can I submit more than one poem? We ask poets to submit one poem only, so send us your best! What happens to non-winning poems? 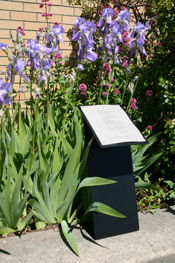 Each year, the committee looks for opportunities to display all of the poems submitted to the contest. In past years, this has included exhibiting them in the window of Mindport (downtown Bellingham), at the Bellingham Public Library, and at the awards ceremony. My poem was one of this year’s winners. Which bus is it on? Whatcom Transportation Authority tells us that any single bus travels a variety of routes each week, so while your poem may be on the Guide today, it will be circuiting downtown tomorrow. That’s good for the poets, because they get a wide exposure throughout the county, but it’s not good for tracking an individual poem. We’ve tried to figure this out before, and the best we can do is to recommend that you ask all of your bus-riding friends to keep an eye out for your poem, then note the bus number (not the route number). Not a perfect solution, but the only one we have at the moment. Will I get my poem back? We are unable to return any poems and strongly urge poets to keep a copy of their own submissions. How can I support the Sue Boynton Poetry Contest? Subscribe! Link! Make a donation! When you subscribe to this blog and put a link to it on your own website or blog, it increases our traffic and helps more poets find the contest and the useful information provided here. The Sue C. Boynton Poetry Contest is a program of Whatcom Poetry Series, a 501(c)(3) non-profit organization. The contest is organized by a committee of volunteers with no paid staff and a very modest budget. Funding depends exclusively on the generosity of individual and corporate poetry enthusiasts. All donations are greatly appreciated and tax deductible. If you have a question about the Sue C. Boynton Poetry Contest, leave a Comment or address it to BoyntonPoetryContest[AT]hotmail.com.